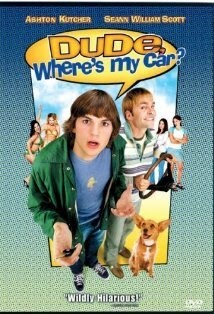 Dude, where's my car is the movie that unleashed Ashton Kutcher upon the world, paving the way for a whole new generation of stoner movies. This movie is squarely responsible for such absurdities wrought upon this world as Zoltan, shibby, "... and then", super hot giant alien chick, dude & sweet, Continuum Transfunctioner, and the ten different ways to say "dude, where's my car". Following the capers of two potheads (Ashton Kutcher and Sean William Scott) who, predictably, have no clue where their car is parked after an epic night out. As they try to re-discover what happened the previous night, the whole world seems upside down. Hot chicks sprout up like mushrooms after a tropical rainfall, groups of random stranger either want to kidnap them or be best friends with them. Very soon they realize that something they might have known the night before could be all that stands in between them and inter-galactic annihilation. There are tons of laugh out scenes, that have been copied and parodied endlessly. One of the funniest is the "... and then" sequence, the battle of wits between Ashton and an Chinese takeout microphone box. Then there is the tribute to communication every couple should envy - "what does my tattoo say" conversation. Not to forget the bubble-wrap spacesuit space nerds or the alien Nordic dudes or Pierre and the ostrich compound. The movie is cheesy, trite, slapstick and childish. The whole thing is filled with jokes that obviously make more sense further under influence one is. Otherwise, there is no reason how anyone sane could come up with and film the scenes that litter the movie. And I guess that is what you need for a classic stoner movie. And when you are in the mood to engage none of the cells in your brain, that is the kind of movie you want to settle in the sofa with.